Sold by Faultless and Fulfilled by Amazon. Gift-wrap available. 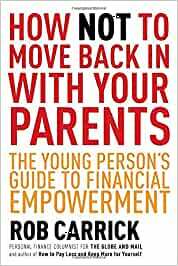 In this era of the Boomerang Generation, here at last is a full and frank guide to avoiding the need to move back in with your parents. Rob Carrick of The Globe and Mail is one of Canada's most trusted and widely read financial experts. His latest book is the first by anyone to target financial advice specifically at young adults graduating from university or college and moving into the workforce, into the housing market and into family life. Financial beginners, in other words. The book is mindful throughout that parents have a big role to play in all this. It addresses young readers throughout but regularly asks them to see things from their parents' perspective. In that way, Rob Carrick is able to offer advice to both generations. He even recognizes that in these difficult times, moving back in with the folks is sometimes a short-term necessity. So there is a section devoted to such important questions as: Should your parents be charging you rent? For that and many thousands of dollars' worth of other reasons, this is a book that every parent needs to buy for each of their kids, plus one for themselves. Sold by Faultless and ships from Amazon Fulfillment. Start reading How Not to Move Back in With Your Parents on your Kindle in under a minute. ROB CARRICK is one of Canada's most trusted and widely read financial experts, with over two decades of experience as a business and economics reporter and commentator. He worked on both Bay Street and Parliament Hill before becoming the personal finance columnist for The Globe and Mail in 1996 and is the author of four previous books, including How to Pay Less and Keep More for Yourself and Rob Carrick's Guide to What's Good, Bad and Downright Awful in Canadian Investments Today. Carrick lives in Ottawa with his wife and family. I love it! Sharing it with my teenage daughters and referring to it often in the course I'm teaching to university students on Personal Financial Planning. This is an outstanding introduction to the complex and intimidating world of financial management. I find this book answers all the major questions I had about how to set myself up for financial success, with clear explanations. I learned about TFSAs, RRSPs, mutual funds, exchange-traded-funds, choosing banking products, mortgages, homeownership, car ownership costs, budgeting, debt, and other essential topics. This book is extremely readable but doesn't hum and haw. I can't stand some financial "advice" that basically boils down to equivocation and never giving a straight answer. Rob Carrick manages to tailor his advice to a wide range of possible scenarios while still giving straight answers on making good decisions. Recommended 5/5. I bought this book as a parent to give to my son for when he graduated. After giving it a quick read, I realized the information in the book is useful for anyone trying to figure out how to manage their debts, regardless of their age or occupation. There are numerous tips I will be using when I renegotiate my mortgage, taking on and paying off debt, and so on. And I am certain my son will find the information helpful as he makes financial decisions from here on out. A great investment in your children. Full of advice that they do not want to hear from you. I bought this book and The Smart Cookies' Guide to Making More Dough and Getting Out of Debt: How Five Young Women Got Smart, Formed a Money Group, and Took Control of Their Finances around the same time and found them both helpful. It's too bad that financial literacy wasn't taught when I was at school, as I was pretty much clueless about saving and investing as a young adult. I have to admit. I opened this book with much anticpation. I was very disappointed with the advice Mr. Carrick provided to his readers. As a recent graduate from school I thought I could gain some insights into what I could do better with my finances, and did not. Do not buy the book. Don't spend more than you have, get a job during university and minimize your student debts - and do not drink your face off every weekend.